While I've marked some ingredients as optional here, in reality most of the ingredients are optional. The only caution I'll make about substitutions is that leafy greens tend to be too moist to work well in dumplings; opt for bok choy or Chinese cabbage instead. 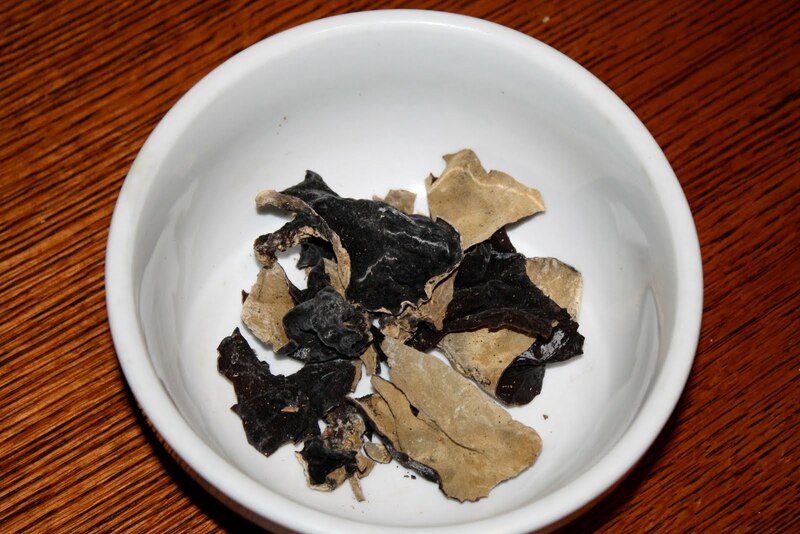 For those of you unfamiliar with black wood ear, it's a mushroom relative that you've probably eaten in hot and sour soup without realizing it. 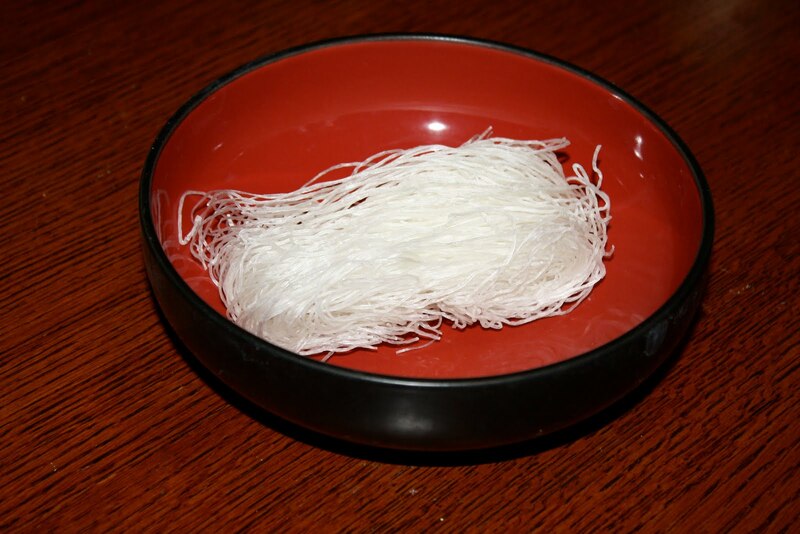 It's sold dried in most Asian food stores and has medicinal qualities according to Chinese medicine (nourishing the yin, moistening the Lungs, and generating fluids). Wood ear has a mild flavor and firm texture, so don't be afraid to try it out if it's something new to you. 1. If using black wood ear, rinse and soak the pieces in warm water until soft, about 30 minutes, then cut off and discard the fibrous base. Cut into ½-inch pieces. 2. 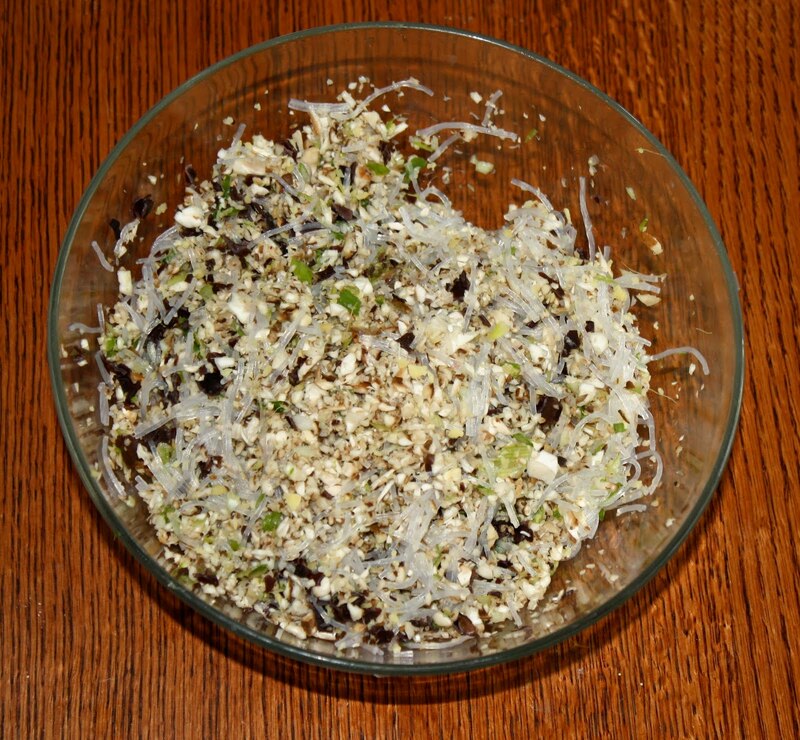 Soak the cellophane noodles in warm water for about 20 minutes. Drain and then chop into 1/2-inch pieces. 3. 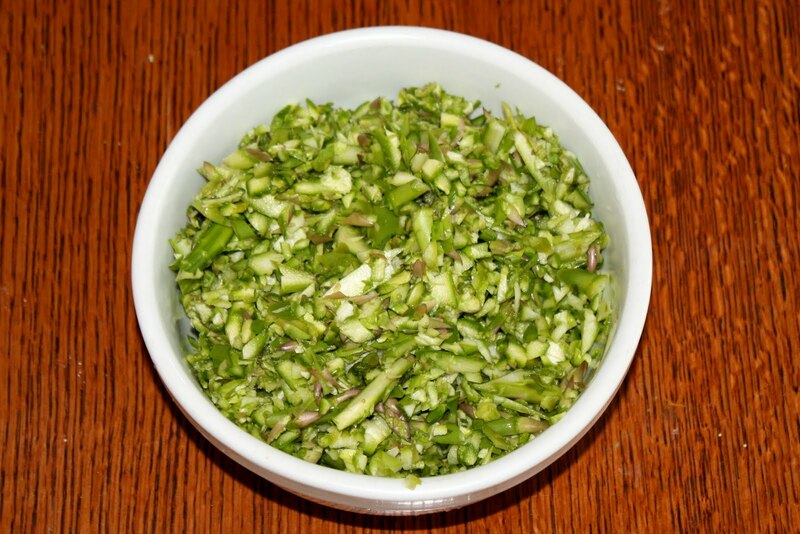 Mince the asparagus by hand, or more conveniently by whirring briefly in a food processor, and put aside. 4. Mince the mushrooms, green onion, and ginger by hand or by using a food processor, and place in a large bowl. 5. 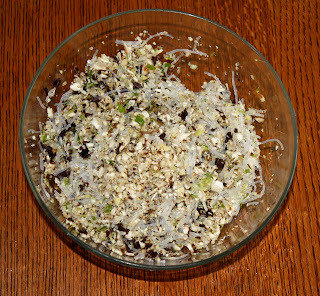 Add the chopped noodles, sesame oil, and salt, and mix well. 6. 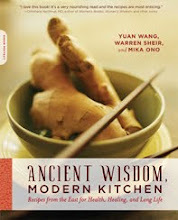 In a wok or skillet, heat 2 tablespoons of oil over medium-high heat. Add the asparagus and baby shrimp, if using, to the pot and cook for a minute. 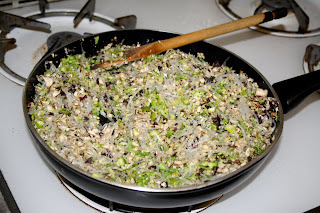 Then add the remainder of the vegetable mixture, and stir-fry for another 3 minutes or so, until fragrant and cooked. 7. Beat the egg in a small bowl, then stir it into the vegetable mixture. Turn off the heat. 8. 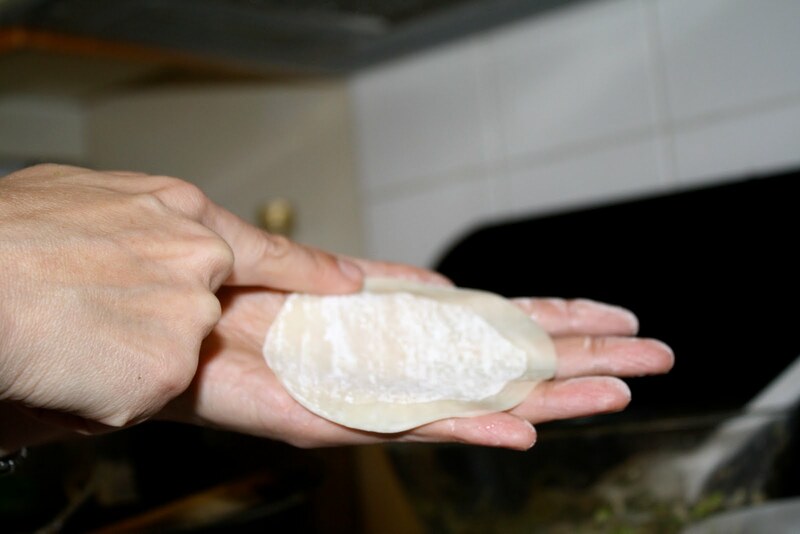 Take one dumpling skin and wet its edges. 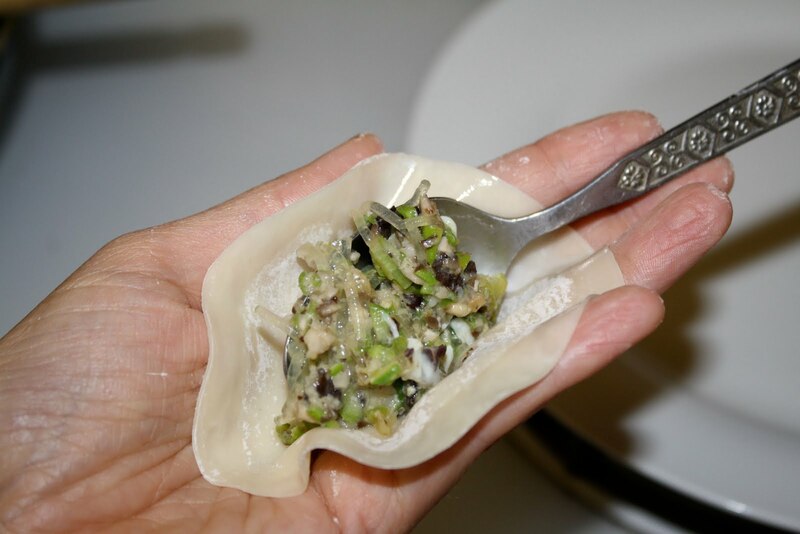 Place one spoonful of the stuffing onto the center of the dumpling skin, squeeze out any air, then pinch the wrapper tightly along the edges, making a lumpy semi circle and sealing the stuffing inside. 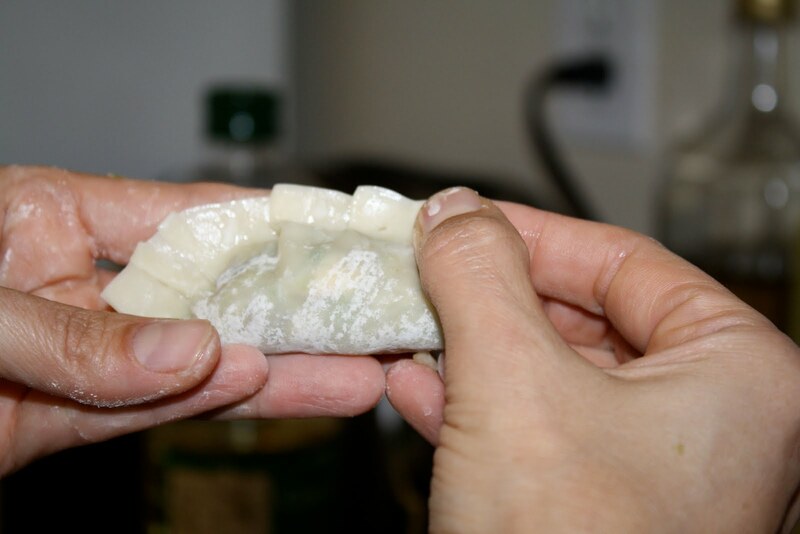 To ensure a tight seal, wet the semicircular edge of the dumpling wrapper again on one side and make five 1/8-inch pleats along the edges, pinching tightly. Repeat until the stuffing is used up (which may take some time). 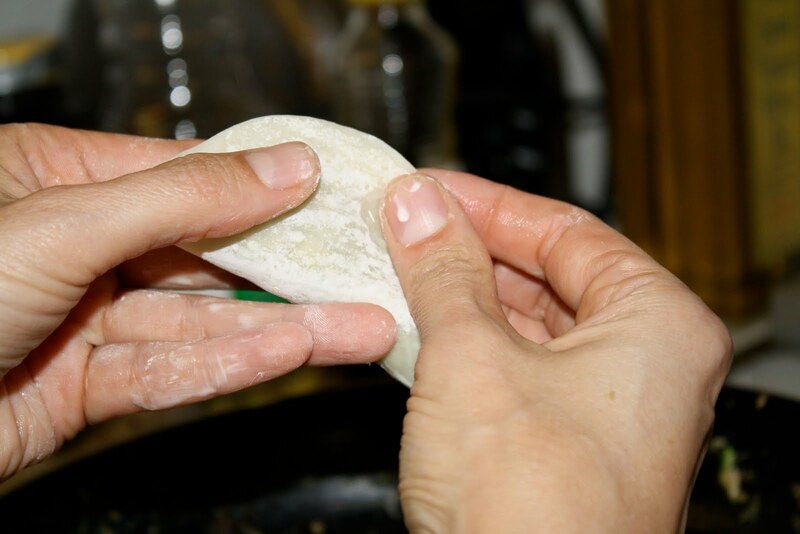 It can be helpful to flour the plate you are putting the finished dumplings on, so they don’t stick to it. 9. 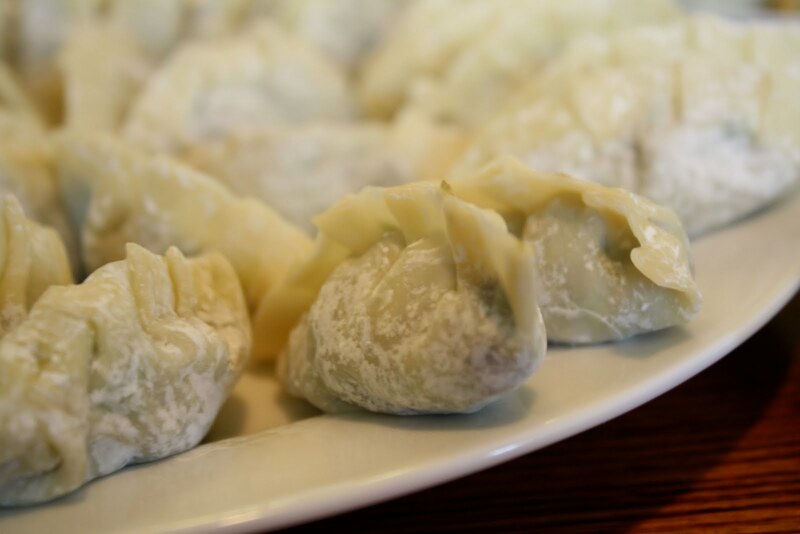 In a skillet, heat 2 tablespoons of oil over medium-high heat, then place the dumplings in the pan, working in batches. Fry over a medium heat for 2 to 3 minutes, or until the bottoms of the dumplings are golden. 10. Add 1/2 cup water all at once (be careful of splattering) and cover quickly. Cook for 5 to 7 minutes, until most of the water has boiled off. 11. Uncover the skillet, lower the heat to medium-low, cook for another 2 minutes, then remove the dumplings from the pan. 12. In a small bowl, mix together the ingredients for the dipping sauce (garlic, vinegar, soy sauce, and chili oil, if using). 13. Serve your dumplings warm, with the dipping sauce on the side. According to traditional Chinese medicine, this dish moves the Liver qi and calms the spirit. It makes a good springtime meal. Yuan says that she used the leftover dumpling stuffing as a filling for baked stuffed mushrooms, too!